Washing dishes with cold water is not possible in every season. Everybody need hot water for washing dishes in winter. To get instant hot water through your sink taps, use under-sink instant hot water heater. An under-sink instant hot water heater is a compact water heater which can be installed under your sink where you require hot water. These water heaters are available in tankless as well as in tank form. Here, we present you the best of instant hot water heaters under-sink reviews available along with a complete description of every detail of the product. Why do you need an under-sink water heater? Let’s say that you have installed a hot water tank in your basement and provided connections where you needed initially. Now you need instant hot water in one of your sink faucet which is not connected with the heater in the basement, here you can use an under-sink water heater. An under sink water heater will fit under your sink, taking a small area to fit, and will provide instant hot water from the faucet. There is no need of complex plumbing because the water heater is installed under the sink, very close to the faucet. The under-sink water heater’s installation is less expensive because installation needs only a few pipes. It also saves your construction cost as you do not need to get the pipe from any other room hence no wall is damaged. Consumes less energy, you can switch it on whenever you need instant hot water. Light-weight, you can mount these water heaters on a wall as well. Bosch Tronic 3000 T electric mini-tank water heater is under the sink water heater and it provides hot water right in your sink’s faucet without taking any time. 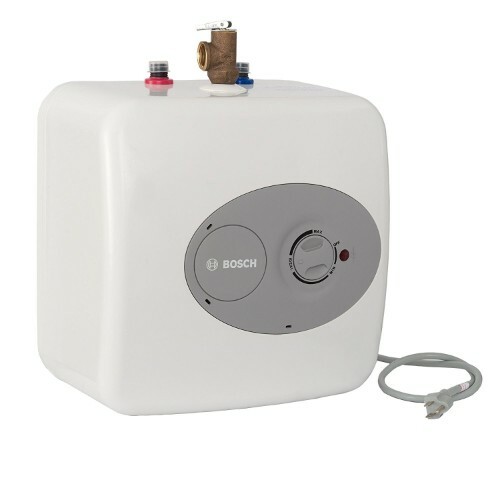 The Bosch ES4 Tronic 3000 T is a 4-gallon glass-lined mini-tank water heater. It measures 13.75 W x 13.75 H x 13.5 D inches which are a good size for an under sink water heater. It has an inlet of cold water (color-coded blue), an outlet of hot water (color-coded red), and a pressure relief valve to control or limit the pressure on the top of the water heater. On the front panel of the Bosch Tronic best under sink hot water dispenser, there is a temperature adjustment knob and a LED light which is on when the heater is on. This heater weighs 17.4 pounds and consumes 1440-watt power while heating water. Installation of Bosch Tronic 3000 T is really simple. Plug it directly into any standard 120-volt outlet, make the pipe connections and get the hot water where ever you want it. This product comes with a manufacturer’s 6 years limited warranty on inner tank, 2 years limited warranty on other components. Provides hot water instantly at your sink. Very small leakage from the pressure release valve. Can be shelf, wall or floor mounted. Has glass-lined tank for long service. Supplies up to 2 faucets at a time. InSinkErator HWT-F1000S is an instant hot water tank, which includes the new water filtration system in addition. The InSinkErator HWT-F1000S is a 2/3 gallon compact stainless steel hot water tank, which dispenses 60 cups of 200˚F water per hour. This hot water tank measures 6-1/8 x 6-3/4 x 10-7/8 inches and the filter has 2-1/4 inches diameter and 12-1/2 inches height. This unit also has a temperature regulator on the front panel which you can use to easily adjust the temperature (160 to 210 degrees F) of the water. At its highest temperature, the hot water tank provides near-boiling water. This heater weighs 7.28 pounds and consumes 750-watt power while heating water. Installation of the InSinkErator HWT-F1000S needs simple plumbing, which is included with the product. There is no need for tools for making tank connections. You can mount the water heater anywhere, mount through holes are provided. Plug this under sink water heater in any American standard 120 volts outlet. This system includes an exclusive ‘We Come to You’ 3-Year In-Home Limited Warranty on the tank and 1-Year on the filtration system. Stainless steel instant hot water tank. The filter is not that good. Easy to adjust the temperature. Tool-free tank connections and dry-start protection. Ecosmart POU 3.5 is a point-of-use electric tankless water heater which is specifically designed for single sink applications. 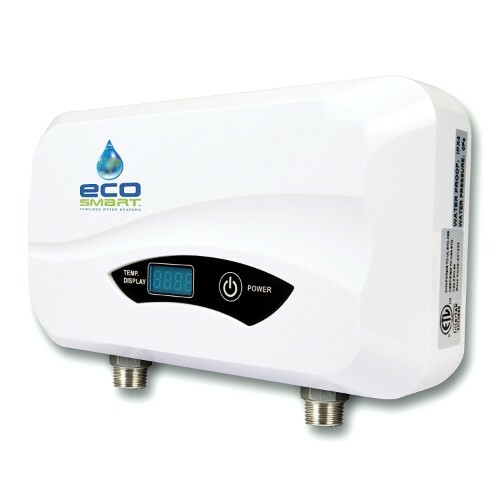 The Ecosmart POU 3.5 provides a maximum flow rate of 0.5 gallons per minute and includes a sink aerator for mixing air in the water for maintaining the pressure. This under sink instant water heater measures 11 x 3 x 6 inches, compact size and saves up to 12 cubic feet of storage space. On the front panel, this unit includes a digital temperature display in unit degree increments and a power on-off button. The temperature of the water is controlled by the flow rate of the water. This instant water heater should be used in areas where the inlet water temperature is lower than 57°F. At this temperature, the water can be further heated up to 105°F providing 0.5 gallons of hot water. This water heater weighs 4 pounds and consumes 3500-watt power while heating water. The installation of the Ecosmart POU 3.5 water heater is very easy under the sink because of its smaller size. This unit includes one inlet for cold water (color-coded in blue) and one hot water outlet (color-coded in red). If you know basic plumbing, you can install the unit without any trouble. For the power supply, this under sink instant water heater needs a 120 volts outlet and 100 amp electrical panel connected to #10 AWG wire. 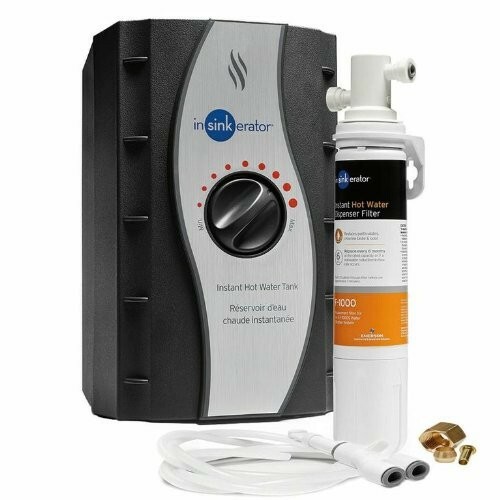 This instant water heater includes 1 Year Limited Warranty on electronics, exchanger, and elements. Warranty only covers the cost of the heater; does not cover labor or any incidental damages. Does not provide very hot water. Bosch Tronic 3000 US3 is an ultra-compact tankless electric instant under sink water heater. The Bosch Tronic 3000 point-of-use under-sink tankless water heater which has 98% thermal efficiency. This instant water heater measures 6.5 x 12.25 x 3 inches. With this compact size, the Bosch Tronic 3000 US3 can be mounted under any sink. This heater can serve two sinks at a time and the temperature of the water is controlled by the flow rate of the water. At 0.5 gallon per minute, this heater will provide a rise of 45°F. This water heater is very lightweight. It weighs 5 pounds and consumes 3500-watt power while heating water. This under sink instant hot water heater is very easy to install. It requires basic plumbing and a nominal 120 volts outlet. 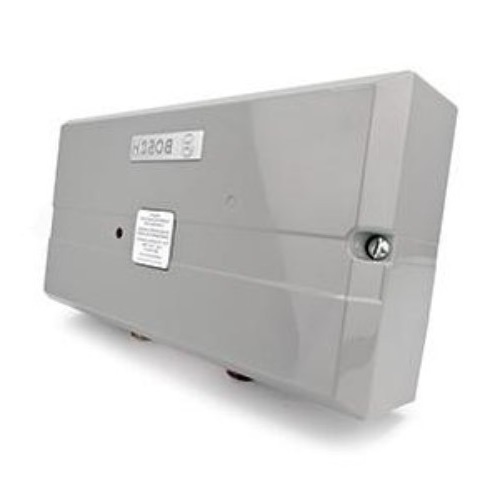 You can mount this tankless unit horizontally or vertically according to the mounting space. The Bosch Tronic 3000 US3 comes with a 5-year limited warranty and serves as the best under sink hot water dispenser. Tankless on demand instant water heating. Does not have a temperature regulator or temperature display. Compact, lightweight and elegant design. Utilize 98% thermal energy, 98% efficient. 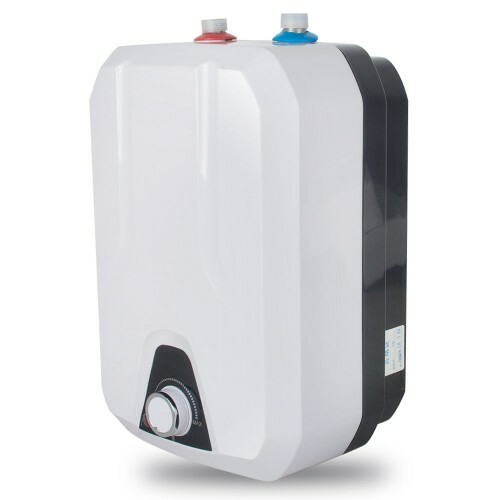 Zinnor Hot Tank Electric Water Heater is a premium quality water heater. It is made of high-quality plastic and metal materials which makes the water heater long lasting. This ready hot water dispenser measures 9.84 x 9.84 x 13.78 inches, a medium size water heater. The Zinnor water heater is a direct heating type water heater. It has a high efficiency and low power heating tube which helps to utilize the energy efficiently. This hot water tank has the capacity of 2.1 gallons (8 liters). The Zinnor water heater has a temperature regulator on the front panel for adjusting the temperature from 55°C (131°F) to 75°C (167°F). This instant hot under sink water heater consumes 1500-watt power and also works on higher floors with low water pressure. The weight of this instant hot water heater is 6.6 pounds. It is an environment-friendly water heater, made of a green environmental material, it qualifies the international standards. This hot water tank is very easy to install. Plug it directly into any standard 120-volt outlet, make the pipe connections and get the hot water at the point-of-use. The product has no warranty. High-quality plastic and metal material. Has a temperature regulator, and provides pretty hot water. In the end, we present you the best available options for the top-rated under-sink water heaters, you can choose them as per the need, availability of space and usage. You can take help from the under-sink heater comparison table for reference.